Important: Version 2.0 of the ESB Guidance is called the BizTalk ESB Toolkit. This version extends BizTalk Server 2009 capabilities. To learn more, see BizTalk ESB Toolkit 2.0 on the BizTalk Developer Center or download the BizTalk ESB Toolkit from the MSDN Download Center. Customers who are using ESB Guidance 1.0 are strongly encouraged to upgrade to BizTalk Server 2009 and the BizTalk ESB Toolkit 2.0. The 1.0 release and documentation will be deprecated in August 2009. The Microsoft ESB Guidance provides architectural guidance, patterns, practices, and a set of BizTalk Server R2 and .NET components to simplify the development of an Enterprise Service Bus (ESB) on the Microsoft platform and to allow Microsoft customers to extend their own messaging and integration solutions. Based on the experience Microsoft has gathered from many successful real-world SOI implementations, you can think of an ESB as a collection of architectural patterns based on traditional enterprise application integration (EAI), message-oriented middleware, Web services, .NET and Java interoperability, host system integration, and interoperability with service registries and asset repositories. Figure 1 shows a high-level view of the type of interconnectivity that an ESB architecture can provide. New core features, such as itinerary processing, centralized event logging, the Exception Management Framework; it also introduces the AmberPoint Embedded Nano Agent for BizTalk Server and the SOA Software Management Point for BizTalk Server. Itinerary services. These include agents for performing transformations and message delivery. You can create custom services that participate in Itinerary processing. On-ramps. These receive external messages in a range of formats and transports, such as HTTP, JMS, WMQ, FTP, Flat File, and XML. They are typical BizTalk receive locations that optionally use the Microsoft ESB Guidance interop pipeline components and the Microsoft ESB Guidance Resolver and Adapter Provider Framework for dynamic resolution of endpoints and metadata. Off-ramps. These implement send ports for the delivery of messages using formats and transports such as SOAP, WCF, JMS, WMQ, FTP, HTTP, Flat File, XML, or any other custom formats. They are typical BizTalk send ports that optionally use the Microsoft ESB Guidance interop pipeline components and the Microsoft ESB Guidance Resolver and Adapter Provider Framework for dynamic resolution of endpoints and metadata. Many of these components and services rely on features implemented by BizTalk Server 2006 R2, such as the Orchestration, Transformation, and Business Rules engines and the Message Box database. 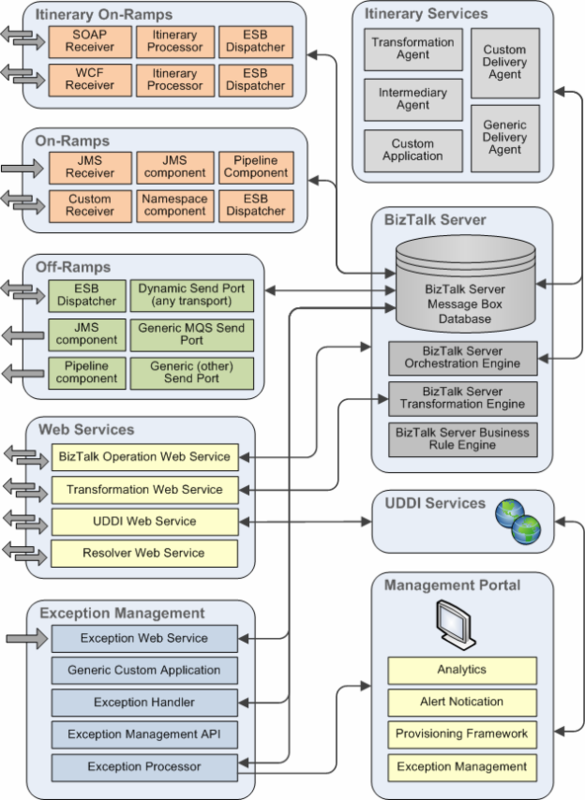 Figure 2 shows a schematic view of the categories; the components and services typically occurring within each category; and the core BizTalk system components used by the Microsoft ESB Guidance. The Microsoft ESB Guidance accepts inbound messages and operates on them, perhaps (but not always) by performing processes such as transformation, delivery, or any other custom defined process. To specify the operations required, the core processing components require a message to contain associated instructions or metadata that define the processes to apply and the tasks to execute with the message content. This approach provides loose coupling between services; this means that the ESB does not require prior knowledge of the specific processing for each message. It just has to know the possible range of processes and how to apply each process. The wide range of options for specifying the available processes and the mapping between the processes and the instructions within messages provides a flexible mechanism for configuring and adjusting behavior, without requiring changes to code and redeployment of components. The architecture that ESB uses, where processes deposit messages in the Message Box database and subscribers pick them up based on a processing instruction in the message, effectively implements the state-machine design pattern. 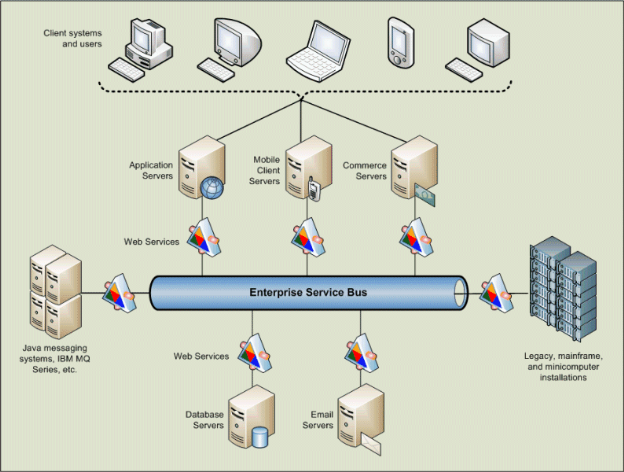 In addition, the ESB implements and exposes its core functionality in a services-oriented manner, including to external applications through a set of core Web services. This loosely coupled approach to designing BizTalk and ESB-based applications yields highly scalable solutions and has become an industry-accepted best practice. After installing the Microsoft ESB Guidance, you should read the "Getting Started" topic in the documentation to understand the architecture, message flow, and the core components of the Microsoft ESB Guidance. You should also install and run the samples included with the Microsoft ESB Guidance, which demonstrate the common use cases described in the "Getting Started" topic and other messaging scenarios. This approach will help you quickly grasp how the Microsoft ESB Guidance works and how you can take advantage of its features in your own SOA applications. This guidance, like many patterns & practices deliverables, is associated with a community site. On this community site, you can post questions, provide feedback, or connect with other users for sharing ideas. Community members can also help Microsoft plan and test future releases and download additional content, such as extensions and training material. Version 2.0 of the ESB Guidance is called the BizTalk ESB Toolkit. This version extends BizTalk Server 2009 capabilities. To learn more, see BizTalk ESB Toolkit 2.0 on the BizTalk Developer Center or download the BizTalk ESB Toolkit from the MSDN Download Center. Customers who are using ESB Guidance 1.0 are strongly encouraged to upgrade to BizTalk Server 2009 and the BizTalk ESB Toolkit 2.0. The 1.0 release and documentation will be deprecated in August 2009. Questions? Comments? Suggestions? To provide feedback about this guidance, or to get help with any problems, please visit the Microsoft ESB Guidance Community site. The message board on the community site is the preferred feedback and support channel because it allows you to share your ideas, questions, and solutions with the entire community. The Microsoft ESB Guidance for BizTalk Server R2 is a guidance offering, designed to be reused, customized, and extended. It is not a Microsoft product. Code-based guidance is shipped "as is" and without warranties. Customers can obtain support through Microsoft Support Services for a fee, but the code is considered user-written by Microsoft support staff.